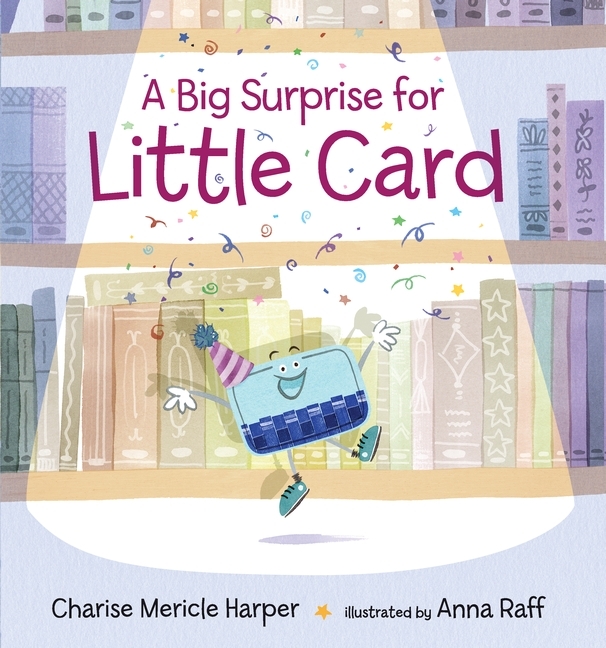 Join us as Charise Harper and Anna Raff debut the trailer for their brand new picture book, A Big Surprise for Little Card! Watch the video below, then keep reading to learn more about the inspiration behind the story. Can you tell us a little bit about LITTLE CARD’s story? Charise: First off, I have to say that throughout his journey Little Card has an exuberant and positive spirit. That was important to me. 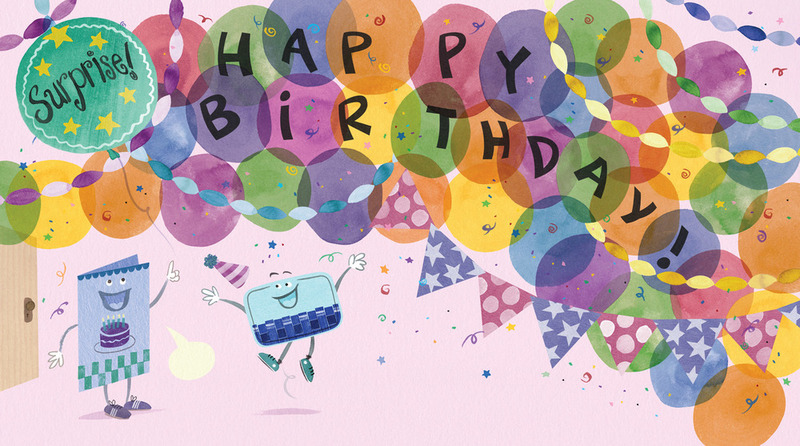 At the beginning of the story, Little Card believes he is a birthday card and like all good birthday cards, he has to go to birthday card school. 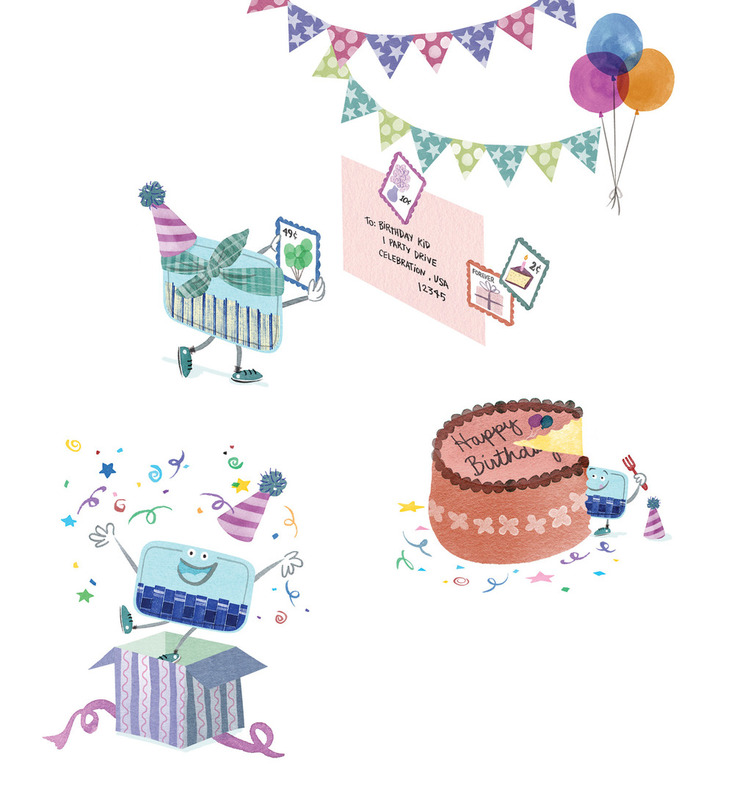 There, he learns all the birthday party essentials – singing, decorating, presents, shouting surprise – and he loves all of it. 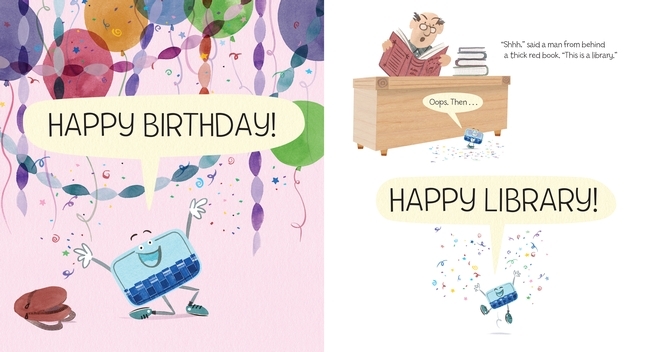 But then comes the twist: there was a mix-up, and Little Card finds out he is not a birthday card at all. 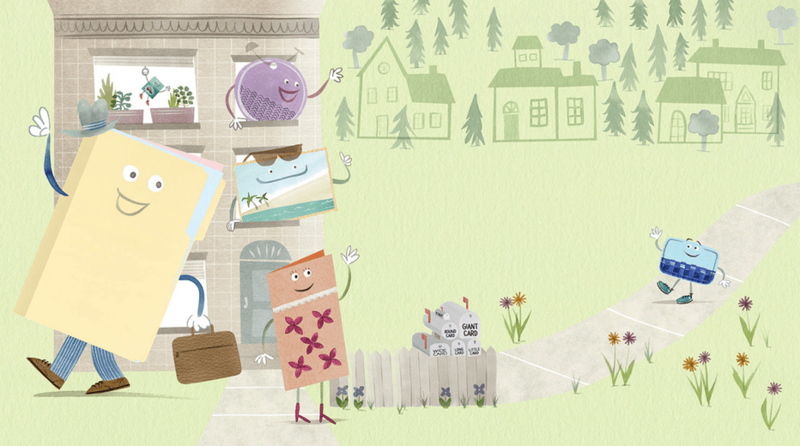 He’s a library card, and his job at the library starts NOW! The next part of the story is my favorite, probably because I love libraries. We watch Little Card use his Birthday Card training to fit into his new environment and meet the girl that will be his new best friend. Anna: In addition to my usual sumi ink wash paintings mixed with pen and pencil, collaged and colored digitally, I made rubber stamps for all of the card characters. In my mind, they required a kind of consistent branding throughout the book that Alex and Miss Penny did not. Charise: I love the page where Little Card is standing on the image of Saturn. [Illustration shows Little Card standing on top of an open library book on a map of the planets. Speech bubble reads, “Look, I’m standing on Saturn!”] It’s the kind of goofy thing I would say. Anna: I like where we tried to emphasize the parallel world that the cards live in. So a favorite moment is when Little Card is at school learning all the ins and outs of birthdays. One of the skills he develops is playing games. I was trying to think of a logical game that cards would play in this situation, and thought a game of “Pin the Stamp on the Envelope” made the most sense. Little Card is about a very special card with a very special job. Do you have a favorite card in your wallet, your house, or elsewhere that you could tell us about? Charise: I have two favorite cards. Hands down my favorite card in my wallet is MY library card. I love the library and even worked in a library back in my teens. I owe my great alphabet skills to years of shelving books with the dewey decimal system. My other favorite card is the birthday card my parents sent me when I was 20 years old. I was traveling in Europe, and it was the first birthday I was going to be away from home and not have a homemade cake. I’m pretty sentimental, so this was a big deal. When I opened the card I screamed. 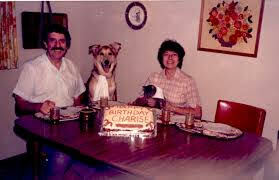 Right on the front was a photo of my parents and the family cat and dog all sitting around the table behind a decorated cake that said, Happy Birthday Charise. P.S. everyone was wearing a napkin tied around their necks. I cried and laughed – best Birthday card ever! Anna: Before I became an illustrator, I worked as a designer at The Metropolitan Museum of Art. For some reason, at my exit interview they neglected to take back my staff ID card, so I still have it. Even though it’s useless, it reminds of a happy time in a past life. Thanks for sharing Little Card with us! 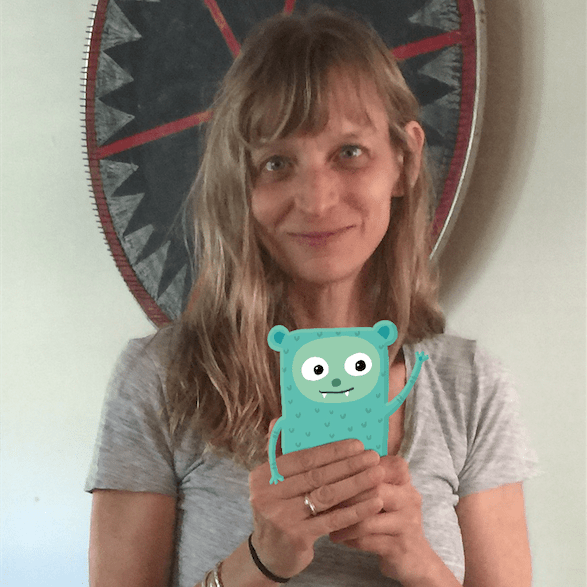 Charise Harper writes stories and draws pictures for children. 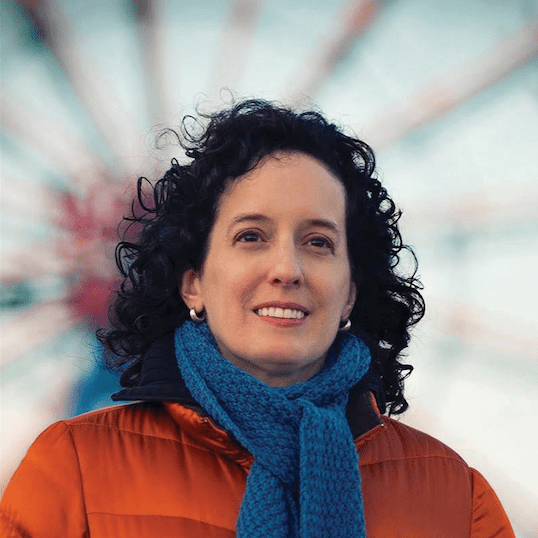 She has authored chapter books, picture books and graphic novels. When she is old, she is going to learn to play the ukulele, but for now she is too busy making lunches and writing books. Thank you Matthew! What a welcome! We all feel so honored to be able to celebrate LITTLE CARD! Thank you for the chance, Charise (and Anna)!